Dynamite's James Bond VARGR #5 is released today (delayed a week from its original March 2 release date). This is the fifth installment in a six part graphic novel series by Warren Ellis and Jason Masters. 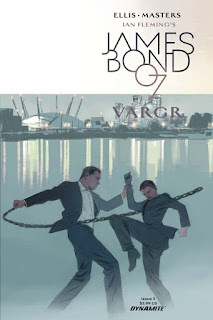 Bond is locked in a death trap in a medical lab in the middle of Berlin, London is going into meltdown as poisoned drugs are turning homes into abattoirs, and the only way to save Britain is the secret of someone or something called... VARGR. You can purchase VARGR #5 at the Dynamite website. The sixth and final installment will be released on April 20. A hardcover collected edition of all six issues will be released on June 21 and can be pre-ordered now on Amazon.com (U.S.) and Amazon.co.uk (UK). UPDATE: Looks like this is delayed again until March 16. Is it available only on Dynamite? According to many other sites, it won't come out until March 16th. Yes, it's been delayed for a 2nd week until March 16. I'm getting fed up with Dynamite. I can't seem to ever land a reliable release date for these books. That is very true. I'm just mad that I keep doing posts that give the wrong date, based on what's on the Dynamite site. Feel like I'm sending people out to be disappointed.